Fancy a 5-star hotel and show break to London? Immerse yourself in the glamour, excitement and elegance of London's West End with a Show & Stay theatre break. With us, you can enjoy great seats at a top West End show and an overnight stay at one of our handpicked 5-star hotels. What could be better than an evening at the theatre followed by an amazing night's sleep in a luxurious hotel room? Treat yourself or someone you love to the 5-star treatment that you deserve. With a massive range of show and hotels available, we're certain that we've got a luxury theatre break package that's right for you. 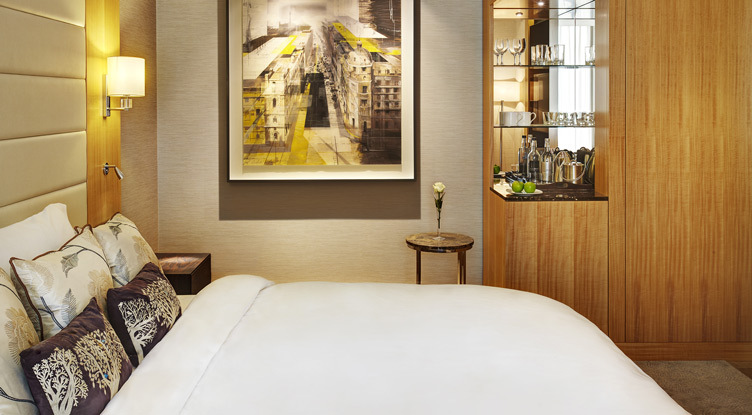 If you're looking for the full 5-star treatment, have a look at the Taj 51 Buckingham Gate Suites with tickets for something bold and exciting like Motown The Musical. For timeless, understated elegance try the Andaz by Hyatt and a West End classic such as Les Miserables or Phantom of the Opera. We have a wide range of spectacular London shows to choose from when planning your hotel and show break. Whether you fancy spoiling yourself with top seats to one of the biggest and best shows in the West End like Les Miserables, or would rather see an old favourite such as The Mousetrap, youre sure to find a hotel and show break to suit your tastes. For a truly magnificent hotel and show break in London, a stay in one of our top rated luxury hotels is a must. Expect the VIP treatment at our most fabulous 4 and 5-star London hotels, complete with mouth-watering cuisine, fantastic facilities and tranquil spa areas. You shall go to the ball this Christmas. The London Palladium is proud to present this year's biggest and most magical pantomime to date — Cinderella! The most captivating rags-to-riches fairytale of them all graces the stage of the West End's most distinguished theatre this Christmas, as pantomime returns to the London Palladium for the first time in nearly 30 years. With an all-star cast, this extravagant and breathtaking production features stunning costumes, opulent scenery and the unmissable and magical moment when Cinderella swaps her rags for a sensational ball gown, and is transported to the Prince's Ball. Sign up here to receive details of when Cinderella will be on sale, delivered straight to your inbox. One dream will change everything. DREAMGIRLS transports you to a revolutionary time in American music history and charts the tumultuous journey of a young female singing trio from Chicago, Illinois called 'The Dreams'. They learn the hard lesson that show business is as tough as it is fabulous. DREAMGIRLS features the classic songs 'And I Am Telling You I'm Not Going', 'I Am Changing', 'Listen' and 'One Night Only'. This much-anticipated new production is directed and choreographed by the hugely successful, Tony® and Olivier award-winning Casey Nicholaw (The Book of Mormon, Aladdin, Something Rotten!) and Amber Riley (Glee) plays Effie White. Sign up here to receive details of when Dreamgirls will be on sale, delivered straight to your inbox. Andrew Lloyd Webber, along with Julian Fellowes and Laurence Connor, brings the awesomeness of this smash hit film to the stage! School of Rock tells the story of a down-and-out wannabe rocker who discovers that extraordinary talent can be found in the most unsuspecting of places. Posing as a substitute teacher, Dewey Finn takes on a job at a prestigious preparatory school where he soon learns that the 5th graders in his class are ready to rock ‘n’ roll. Hoping to break the uptight façade of the class and improve his lacking music career, Dewey encourages the children to create a rock band and enter the Battle of the Bands competition. As time progresses, both the children and Dewey learn about themselves and what is truly important — sticking it to the man and rocking out! Sign up here to receive details of when School of Rock will be on sale, delivered straight to your inbox.